I’ve been running Mac OS X 10.7 Lion for about two hours now, but it didn’t take me that long to notice that something was seriously off with the mouse acceleration. I found myself overshooting pretty much every small target I tried to hit with my mouse. In fact, I felt like I do when I’m forced to use…Windows! Now, Apple has been making concessions to switchers from Windows for years. I’m happy to say that they outnumber the longtime faithful (means the platform is getting successful), and mouse acceleration has been a sticking point for switchers, so changing to a more Windows-like curve is probably the right thing to do. This is small consolation to me, since it doesn’t change the fact that right now, I can barely use my mouse. Ouch! No wonder I’m overshooting things. That curve is way steeper than what I’m used to. Fortunately for me, I didn’t even have to draw a custom curve, since the old curve is still there. 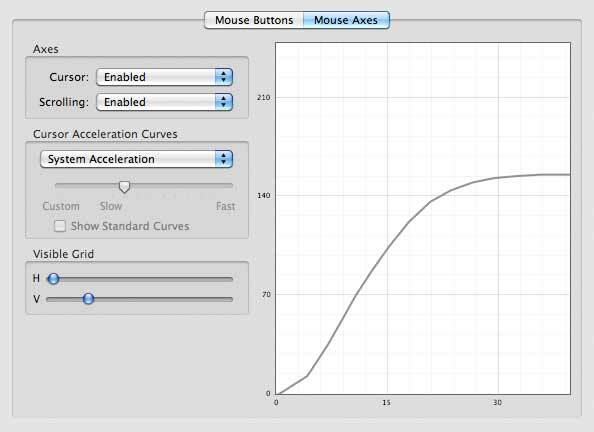 Did you know that every notch in the “Tracking Speed” slider of the “Mouse” preference pane in System Preferences is actually a different acceleration curve? My old curve, which used to reside one notch left of center, is now the second notch from the left. 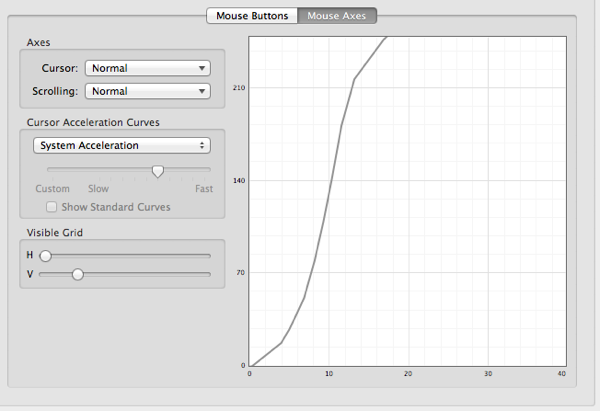 I discovered this, again, because ControllerMate lets you see all the OS standard curves. So, don’t worry; you’re not crazy; your mouse is actually running faster under Lion. Thank goodness the fix is as simple as turning the speed down. Thank you so much for confirming my suspicions, I noticed it instantly… well mostly because when aiming for icons my mouse would suddenly be on the edge of my second monitor. I couldn’t have anything more than post-Lion era Mouse acceleration ! For me, this is a fix but that’s just personal taste. It’s just a matter of what you’re used to. If you’ve been using Macs for the past 17-odd years like I have, you have a lot of ingrained muscle memory with regards to how you use a mouse. I tried to keep any argument out of the post, but in truth I do think the (old) Mac curve is objectively better. It makes a good compromise between precision and speed. Speed things up too much and it becomes difficult to hit small targets, but slow them down too much and it becomes maddening to hit distant ones. A balanced acceleration curve gives you both.